We asked superstar and Rugby League Champion Johnathan Thurston what it takes to keep him performing at his peak. Now one of the most decorated players in the game, Johnathan Thurston is proud to be a North Queensland Cowboy. He has played in every game of Queensland’s unprecedented seven year dominance of State of Origin, has achieved the highest individual honour in rugby league by being awarded the Golden Boot for World Player of the Year, and has the rare distinction of winning two Dally M medals. 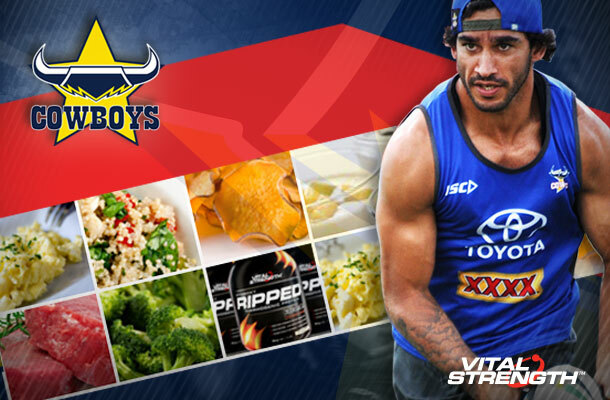 Over the years, JT’s also learnt a thing or two about nutrition and the role it can play in helping (or hindering) performance on the field and in the gym. Vitalstrength: What’s your current body composition goals and ideal weight during the season? JT: I try and hold 87kg. My body fat is normally pretty low so it’s just about eating enough to maintain my body weight and recover from training. It’s important I don’t get too light so I can cope with the collisions, but generally halves have a lot of distance to cover in a game and if you are too heavy it will affect your performance. JT: Preworkout – 1600 Nitroxl (Orange Crush) for a caffeine hit to make sure I’m “paying the rent” (a little saying we have at the Cowboys). It also has Beta Alanine and Creatine to help improve my strength and muscle mass. Post workout – Extreme Rapid Bulk for the carbohydrate and protein intake to help build muscle mass, and Glutamine for recovery and immune system health. I make sure as soon as possible after training I have a good meal with a good piece of meat (steak/ chicken) and some good carbs (rice/ sweet potato). Vitalstrength: What is your standard diet on a non-game training day? JT: Breakfast: 4 Weetbix, honey and fruit as well as 2 pieces of toast with Vegemite. Lunch: Sandwich/wrap with chicken/beef and salad. Snacks: Extreme Rapid Gain (Chocolate) with low fat milk or fruit/yoghurt. Dinner: Good piece of meat with vegetables. Vitalstrength: What about your game day diet? JT: Breakfast: 4 poached eggs & 2 toast, avocado, mushroom and tomato. Sandwiches/meal with lean protein (steak/chicken) and carbs (rice/ potato). Vitalstrength: What’s your normal weekly schedule in the gym during the season? Vitalstrength: How strict are you about diet and nutrition? JT: Pretty strict and consistent. Vitalstrength: Do you have a favourite cheat meal? Vitalstrength: What advice would you give to an up and coming player in regards to nutrition? JT: Seek advice from a professional that knows the requirements of the game. Your food intake may be different depending on position or body type. Vitalstrength: Who is the biggest “foodie” in the team? Explain why. JT: Matthew Scott, he loves his cooking/ coffee and red wine (in the off-season, of course). Very surprising considering he is a boy from the small town of Ilfracombe. Thanks again JT for giving us an insight into your diet and nutrition and a big shout out to the whole team wishing you well for the final series. Watch the Extreme Rapid Bulk Gain Protein Powder video below to find out more.